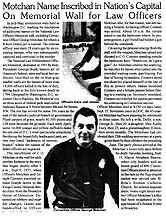 The Summer 1998 issue of NYC DOC's On the Gate featured a full page about the inscription of George Motchan's name on the National Law Enforcement Officers Memorial wall in D.C.
NYC DOC Captain Harry Ahl, thoughtfully and generously, presented NYCHS with a "rubbing" he made of George Motchan's name on the memorial wall in Washington, D.C., after attending an annual service there. The digital image of that tracing appears above. 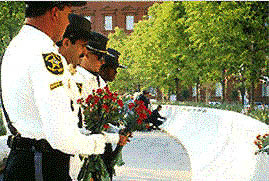 Motchan Name Inscribed on Law Officers Memorial Wall in D.C. In mid-May, ceremonies were held in Washington D.C. marking the inscription of additional names on the National Law Officers Memorial wall, including Correction Officer George Motchan for whom a Rikers Island jail is named. Full page 1998 On the Gate story told of George Motchan's name being added to the national memorial wall. The veteran officer was slain 23 years ago by an escaping inmate, who was subsequently captured and convicted in the murder. The National Law Enforcement Officers Memorial, dedicated in 1991 by then-President George Bush, honors all of America's federal, state and local law enforcers. Inscribed on the its blue-gray marble walls are the names of more than 14,000 officers killed in the line of duty, dating back to the first known death in 1794. Designed by Washington, D.C. architect Davis Buckley, the Memorial sits on three acres of federal park land called Judiciary Square at E Street between 4th and 5th Streets NW. The site has served for some 200 years as the seat of the nation's judicial branch of government. Plush carpets of grass, nearly 60,000 plants and 128 trees decorate the grounds. Each early April, some 14,000 orange and yellow daffodils make the site one of D.C.'s most spectacular attractions. Bordering the beautifully landscaped park are two tree-lined "pathways of remembrance" where the names of the fallen officers are engraved. The enrollment of C.O. Motchan on the wall list adds another footnote to the story that began shortly after 9 a.m., Sept.9, 1975, when Officers Motchan and Joseph Connors escorted inmate Joseph James to the Kings County Hospital dental clinic from the Brooklyn House of Detention. Detained on robbery and murder charges, James was handcuffed to Officer Motchan who, for that reason, was not carrying a firearm. As backup officer, Connors was armed. As Motchan uttered the warning, he was shot by James who rushed into the crowded waiting room, gun blazing. For fear of hitting bystanders, Connors dared not shoot but placed himself in the line of fire to protect others. James wounded Connors and a female patient before fleeing to a waiting car. Seriously wounded, Connors survived but his injuries prevented his continuing in Correction service. Officer Motchan died at KCH six days later, Sept. 15. Seventeen years in DOC, the 45-year-old Motchan had been planning for retirement in three years. He left a wife, Dolly; a son, George Jr., then 20; a daughter, Mrs. Kathy Dory, then 23, and a granddaughter, Eileen, then seven months. The Motchans had celebrated their 25th wedding anniversary at a party given them by their children the preceding June. The party photos arrived at the Motchan’s home only days before his death. Saturday morning, Sept. 19, Mayor Abraham Beame, other city leaders and an honor guard of 600 Correction Officers stood at attention in the rain as the flag-draped casket was carried into St. Rita’s Roman Catholic Church, for solemn requiem mass. Some eight hours earlier Officer Motchan’s killer had been recaptured in the apartment of a female friend in Brooklyn.